The recent Kentucky Derby is another memorable horse race. The recent 139th running of the Kentucky Derby at Churchill Downs in Louisville, Kentucky was won by “Orb.” Orb and Revolutionary were co-favorites to win this year’s Kentucky Derby at 6-1. Revolutionary finished the race in third place and Golden Soul took second place. For those that do not know, Swiss watch brand Longines is the official timekeeper and watch of the Kentucky Derby. Longines is a member of The Swatch Group S.A., which is the world’s leading manufacturer of horological products. After the race completed, Longines awarded Orb’s owner, trainer and jockey with watches from the luxury brand’s Saint-Imier collection at the event’s exclusive Winners’ Circle Party. Represented by tennis legend and longtime Ambassador of Elegance Stefanie Graf, Longines had a strong presence throughout Churchill Downs and other Derby-affiliated events including Taste of Derby, the Longines Kentucky Oaks Fashion Contest, the Kentucky Derby red carpet and the Winner’s Circle Party. Longines timepieces and luxury branded-clocks were also proudly featured throughout the Churchill Downs facilities. 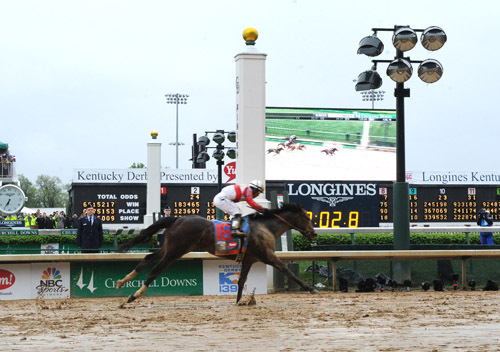 There was a digital Longines Kentucky Derby Countdown Clock displayed on Churchill Downs’ official event website (www.KentuckyDerby.com) and the luxury watch brand’s logo was prominently featured on the official Kentucky Derby red carpet, racetrack and in other surrounding areas. In addition, Longines sponsored the Churchill Distaff Turf Mile presented by Longines on Kentucky Derby afternoon. The luxury Longines Saint-Imier watch collection is inspired by the watchmaking heritage of the brand’s home territory, in Saint-Imier, Switzerland. To celebrate its rich history and roots within the Swiss village, the watch collection includes a series of luxurious timepieces in stainless steel and rose gold bracelet combinations, as well as rose gold and stainless steel leather band combinations. The chronograph watches within the collection are fitted with the column-wheel movement specially developed and produced by ETA exclusively for Longines. All models are also fitted with mechanical movements whose intricate workings can be admired through the transparent sapphire back cover. Lastly, as a result of an expanded partnership with Churchill Downs, this year the Kentucky Oaks was renamed the “Longines Kentucky Oaks.” The brand hosted the Longines Kentucky Oaks Fashion Contest during Longines Kentucky Oaks Day to celebrate the elegant and iconic style of the Kentucky Derby.